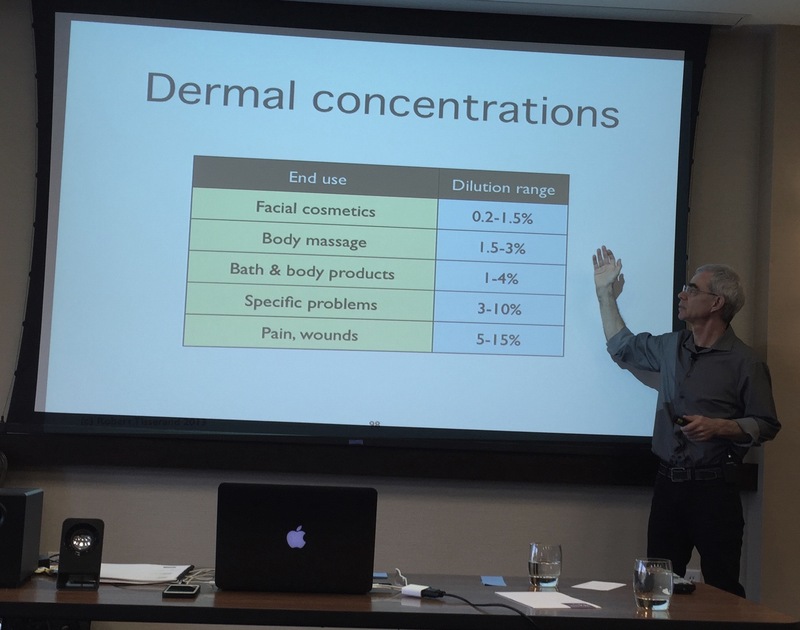 A few weeks ago I attended a class entitled “Essential Oil Chemistry and Pharmacology” offered by Robert Tisserand. If you do not recognize the instructor’s name, he is THE expert on essential oil safety. The classroom was abuzz with students wondering what the latest research revealed concerning aromatherapy safety and applications. The weekend lecture covered topics including how certain essential oil components are metabolized in the body, the toxicity of various aromatic compounds, and essential oils that are free radical scavengers. Yes, there was some serious science involved. On a lighter note, Mr. Tisserand discussed how to use essential oils safely in every day life, from dilutions to methods of administration. The chart above explains the basic general guidelines for diluting essential oils used in skin applications. The chart does not apply to all situations (e.g. some oils have a high risk for irritation and need to be diluted more), but it can be used as a stepping stone when making your aromatic creations. If you would like to make a massage oil with a relaxing scent, then you see that Body Massage concentrations are 1.5 – 3%. This translates to using 15-30 drops of essential oils in 1 ounce of a base oil. The concentration varies depending on the health and age of the individual who will receive the massage, and also basic preferences. The simplest solution would be to add 25 drops of Lavender (Lavandula angustifolia) to a 1 ounce bottle of jojoba oil. And, voila! You made a massage oil.